The historic Çırağan Palace Kempinski Istanbul is a former Ottoman palace. The Çırağan Palace was completed in 1872 for Sultan Abdülaziz, the 32nd Ottoman sultan. 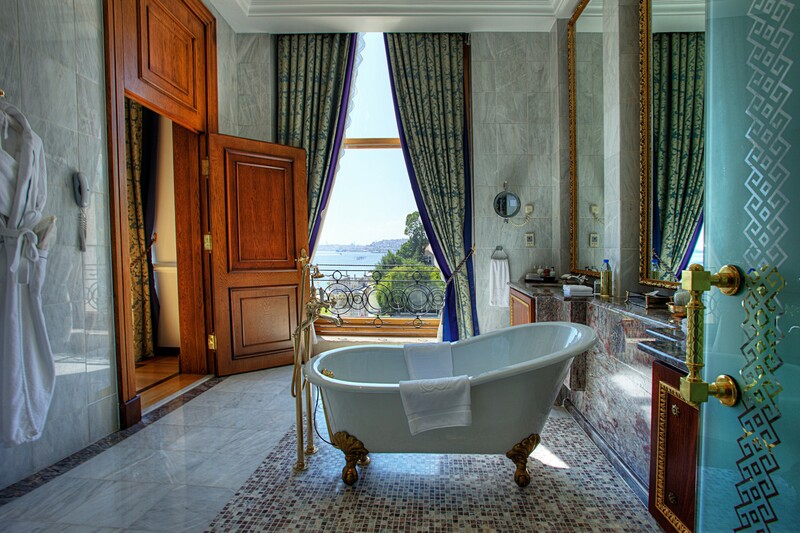 The 5000-square-foot ultra-luxe Sultan’s Suite features a marble bathroom with circular soaking tub. The suite’s master bedroom features a king canopy bed and furnishings in rich red. 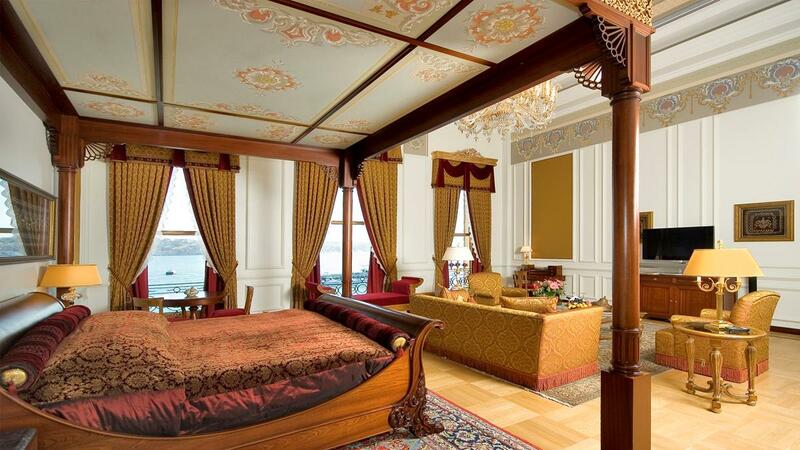 The Sultan’s Suite is the preferred choice of visiting European royals and Middle Eastern celebrities. After a devastating fire, the palace sat in ruins until 1991, when it reopened as a hotel. At Laledan restaurant, the breakfast buffet offers a bounty of over 250 items. 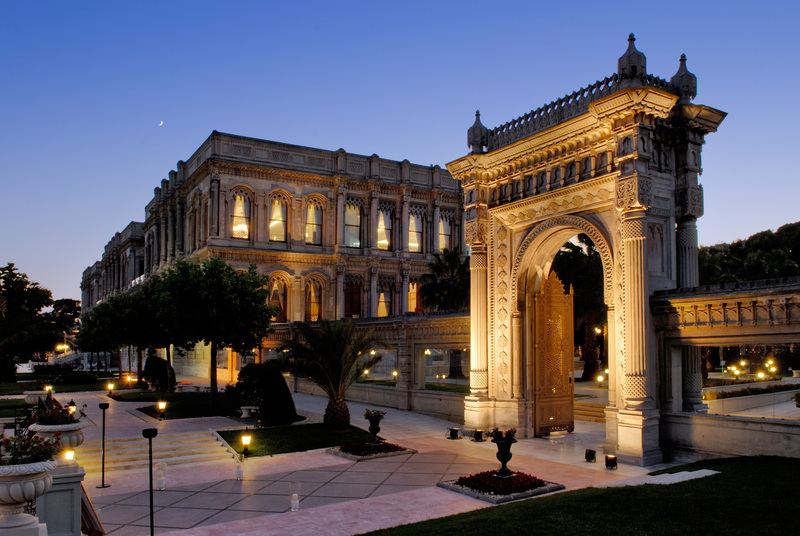 Tugra restaurant, also found in the Imperial Wing, serves modern interpretations of traditional Ottoman cuisine. 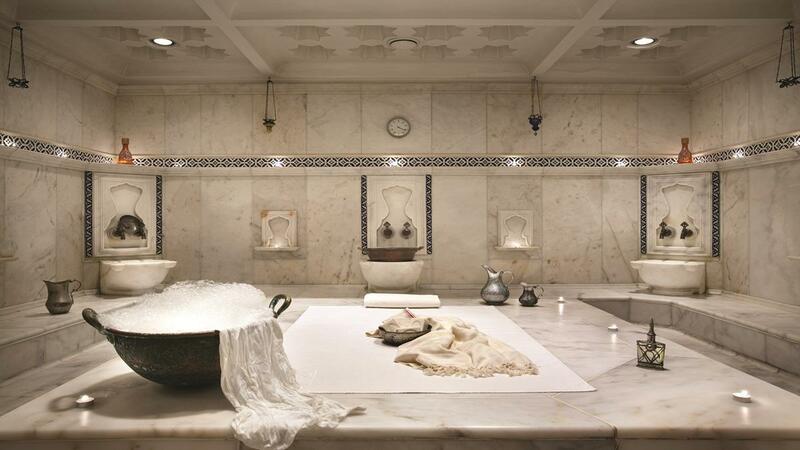 Guests can recover from a busy day exploring Istanbul with time in the hotel’s hammam. Sunset over the Çırağan Palace Kempinski Istanbul’s historic two-storey gate. 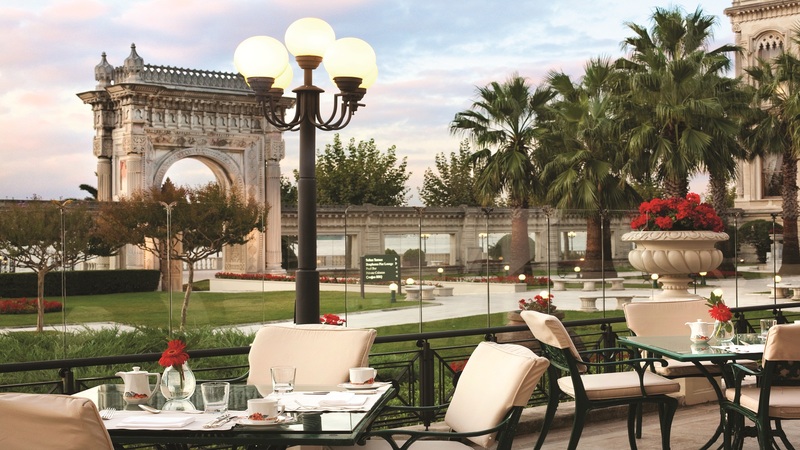 Chilled glasses of Turkish mint lemonade and the gentle scent of roses greet guests at the historic Çırağan Palace Kempinski Istanbul. 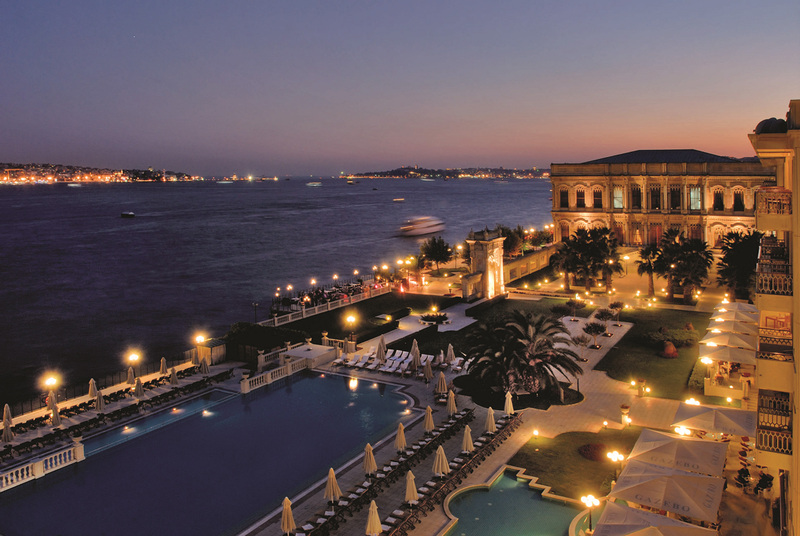 A former Ottoman palace, the elegant hotel boasts three ways to welcome guests: through the gates from the busy Besiktas District, by helicopter, and by water from the Bosphorus River. The Çırağan Palace was completed in 1872 for Sultan Abdülaziz, the 32nd Ottoman sultan. At the end of Ottoman rule, the building barely survived a devastating fire, and for years was in ruins. In 1991, the palace was reopened as a hotel, with 279 rooms and 20 suites in a new wing and 11 suites in the Imperial section. 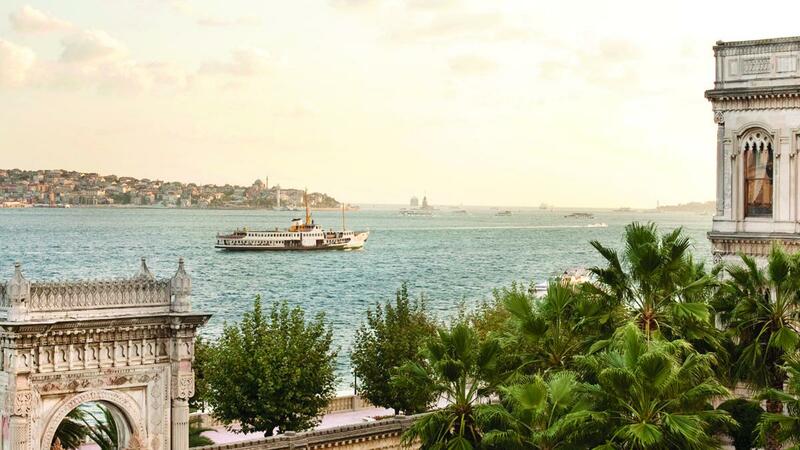 With a baroque-meets-Turkish style as its hallmark, the hotel’s grandiose public spaces, hallways, and seating areas feature overstuffed traditional furniture for lounging and conversation, lavish displays of fresh flowers, and historic photography of Ottoman royalty and Istanbul elite. Shiny marble and stone inlay floors are paired with handwoven carpets, while details such as Islamic-inspired tile art add a historic feel to the elegant accommodation. After an indulgent breakfast at Laledan restaurant, where the buffet offers a bounty of over 250 items, guests can stroll the hotel’s landscaped grounds with view of nearby Yıldız Park, find a lounge spot at the outdoor infinity pool, head to Le Fumoir Pavilion for cocktails or to pose at its historic two-storey gate, with a view of the nearby Bosphorus Bridge connecting the Turkish metropolis’ European and Asian regions. Details such as Islamic-inspired tile art add a historic feel to the elegant accommodation. Standard rooms in the hotel’s newer wing feature traditional furniture and accessories in shades of cream, blue, and red, while spacious marble bathrooms are calming havens thanks to the scent of organic bergamot used in all hotel amenities. Guests can recover from a busy day exploring Istanbul with time in the hotel’s hammam, and by indulging in house-made lokum (a.k.a. Turkish delight) with pistachio, almond, and rosewater, a nightly bedtime treat. Guests arriving at the Imperial Wing entrance, adjacent to the hotel helipad, are welcomed to the exclusive entrance with rose-flavoured cocktails. 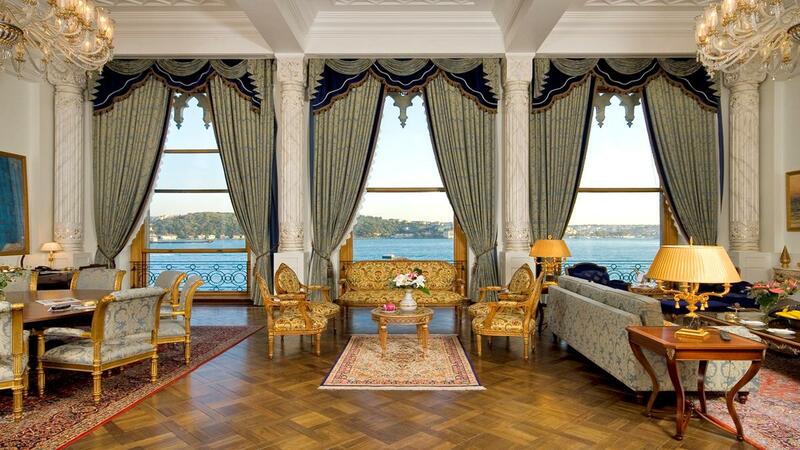 If the three-story chandelier in the stairwell doesn’t impress, peek into the 5000-square-foot ultra-luxe Sultan’s Suite (the preferred choice of visiting European royals, Middle Eastern celebrities, and apparently one of Oprah’s “Favorite Things”). The suite comes with an expansive two bedrooms, living room, dining space for 12, and 24-hour butler. The suite’s master bedroom features a king canopy bed and furnishings in rich red, including a marble bathroom with circular soaking tub, while the guest room is in shades of blue with a glass and marble bathroom featuring a slipper tub with a view of the water. Tuğra Restaurant, also found in the Imperial Wing, serves modern interpretations of traditional Ottoman cuisine. 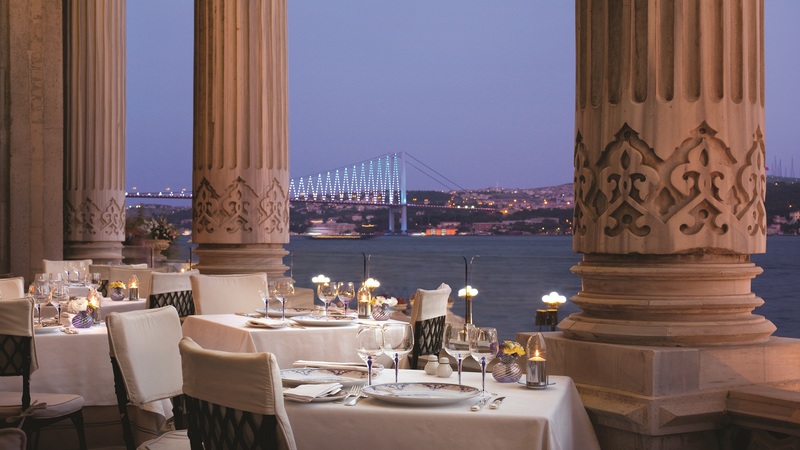 Often selected by Istanbul’s A-list for birthday and anniversary celebrations, don’t be surprised to see excited couples toasting their engagements; sunset in the dining room is a popular time to pop the question. 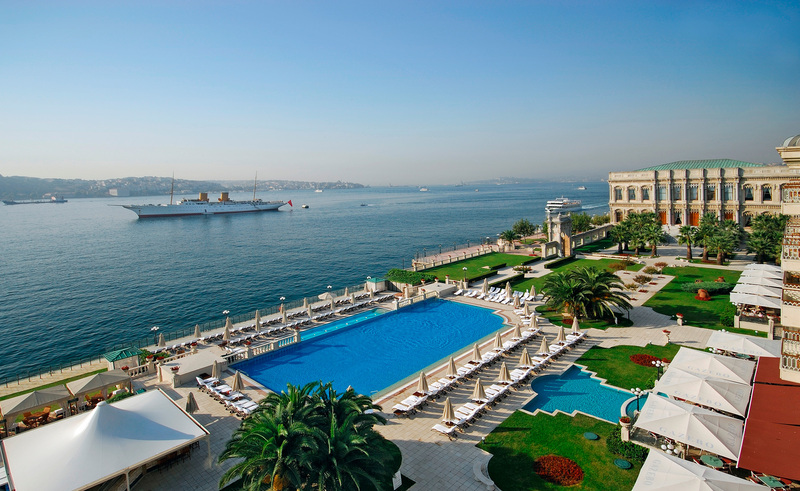 Photos courtesy of the Çırağan Palace Kempinski Istanbul.